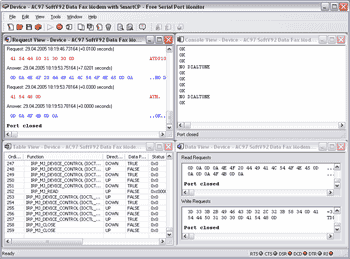 UDM Downloads > Free Serial Port Monitor! Free software serial port monitor, Com Rs232 sniffer with communication packet data analyzer. This monitoring utility can spy, capture, view, analyze, test com ports activity performing com port connection and traffic analysis with data acquisition and control. You can use this system as device interface testing tool, modem data transfer viewer and so on. Serial Monitor can be successfully used for monitoring data flow between serial devices and Windows application, debugging com port connections, developing, reverse-engineering and implementing serial protocol, serial device driver development, serial hardware development, research the functionality of any third-party software and hardware, testing software and hardware. Free Serial Port Monitor can be successfully used by programmers, beta-testers, software developers, hardware engineers, IT support specialists, industrial control personnel, SCADA software engineers, science technicians, systems integrators, consultants, lab experts, University students.